We provide a local dog pet taxi service in Banstead, Belmont, Burgh Heath, Cheam, Chessington, Ewell, Epsom, Epsom Downs, Hook, Morden, Stoneleigh, Sutton and Worcester Park. We understand that it is not always possible for you to transport your dog from A to B. We are happy to provide a pet taxi service to take your dog to the vets or a relative’s/pet sitter’s home. We can help your dog into our pet taxi vehicle and ensure they are safely secure. Our return pet taxi service includes collection of your dog, waiting for your dog’s consultation (if at the vets) and dropping your dog back home. Our dog pet taxi service offers safe, suitable transport with cages or dog guards. 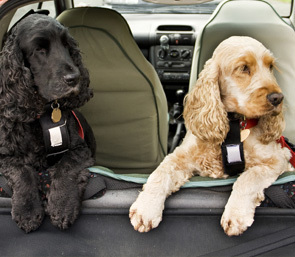 If your dog does not like a cage we have space on the passenger seat, which is fitted with a dog seatbelt. All of our pet taxi vehicles have windows so that your dog can see out of the window and doesn’t panic in the dark. We also provide a pet taxi service as an extension to our dog grooming service. We can collect your dog, pamper/groom your dog and then drop your dog back home.